Allen Cotton looks forward to opening his Beef ‘O’ Brady’s franchise in Panama City Beach on Super Bowl Sunday. Beer will flow from 24 taps. Photo by Rae Cotton. Amid all the remediation and reconstruction there are green shoots, one of them a manifestation of a dream that Allen Cotton had harbored for years. Following his graduation from Colorado State University with a food service degree, Cotton operated a Schlotzsky’s Deli in Callaway. Then, after eight years as a franchise owner, Cotton went to work for food services, first at Bay Medical Center and then for a contractor that supplies meals to public schools. 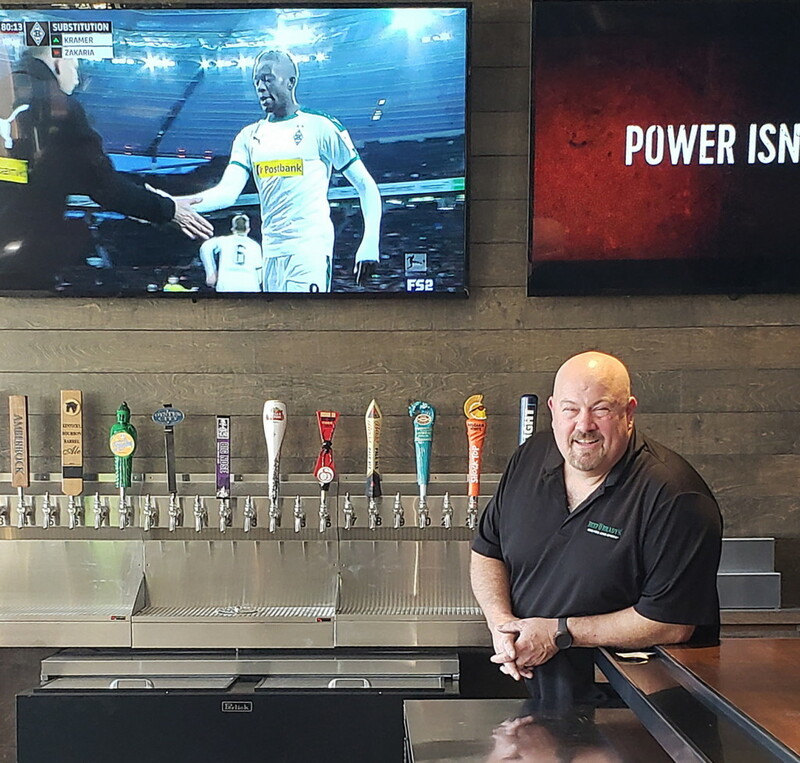 That work was steady and predictable, but over time, Cotton’s desire to return to the restaurant business intensified and on Feb. 3 — Super Bowl Sunday — he will open a Beef ‘O’ Brady’s restaurant in a one-time Publix shopping center on Middle Beach Road in Panama City Beach. “Allen is a food connoisseur and the Beef’s menu attracted his attention,” said Cotton’s wife and co-franchise owner Rae, a former advertising saleswoman who owns her own marketing agency. Cotton stands 6-2 and weighs, well, let’s just say about as much as a panda. The restaurant will be equipped with 40 TVs: 30 55-inchers and 10 65-inchers. An app will enable patrons to choose a screen, take a photo of it with their phone and then listen on their device to the audio broadcast of the game they’ve selected. Outlets with USB ports will be located at every table. Patrons will be able to choose among 24 draft beers — seasonal, craft and familiar. The restaurant will employ about 45 people, Cotton said, and will be open, beginning Feb. 5, seven days a week from 11 a.m. to 10 p.m.
On Super Bowl Sunday, doors will open at 4 and the restaurant will close at game’s end. Cotton could have made a vanilla Tuesday his opening day, but he likes a challenge. “Hey, it’s sink or swim,” he said.